This was a bizarre job. A Disney style piece done believe it or not for...Viagra! Their slogan was, 'Go get 'em, Tiger! ', so they wanted the tiger representing Viagra and their competitors represented by the monkey and the hyena. Quite an odd pairing of style to product, if you ask me. But it was fun to do. 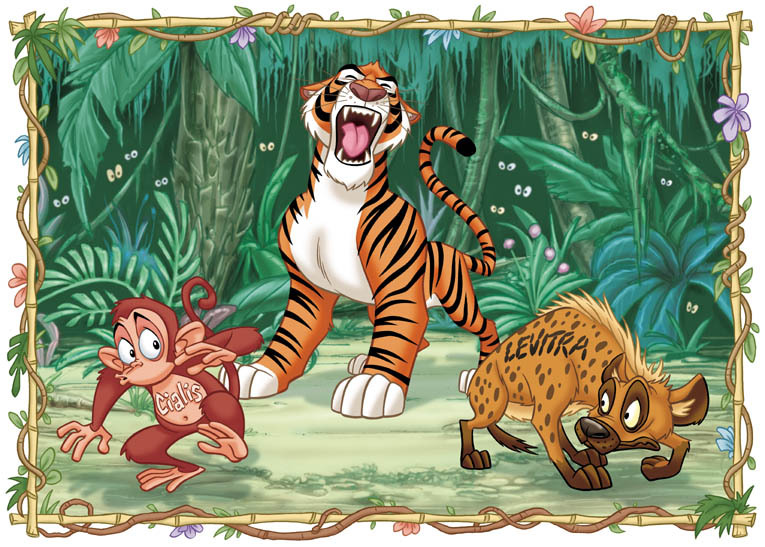 Lovely pic, and the monkey and hyena look suitably foolish and flaccid. Nitpicky old me knows that spotted hyenas are found only in Africa and tigers only in Asia, but that's not important to the message here. However, the concept is worrisomely lacking any women! Surely it's not about competition between men :). But I think the idea was that the products were represented by these animals. I don't think the animals were there to show the effects of the drugs...at least I hope not. Um... Bwah ha ha ha!